The discovery of another moon around Pluto is exciting news for planetary science, but it's also likely causing some anxiety for the team in charge of New Horizons, a spacecraft set to be the first probe ever to visit the dwarf planet. On Wednesday (July 11), researchers using NASA's Hubble Space Telescope announced the detection of P5, a tiny moon measuring just 6 to 15 miles (10 to 24 kilometers) across. P5 brings Pluto's known satellite tally to five, and it comes just a year after Hubble spotted moon number four, the similarly diminutive P4. These two recent discoveries show that the Pluto system is more crowded than scientists had thought. 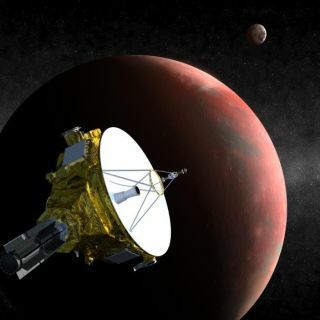 So NASA's New Horizons spacecraft, which is due to fly by the dwarf planet in 2015, may have to watch its step. The concern is not necessarily that New Horizons, which launched in 2006, will slam into a Pluto moon that has thus far eluded detection. The probe is traveling so fast that a particle the size of a BB could destroy it, so researchers are worried about the broad debris field that Pluto's moons may have spawned. "Every new satellite is a debris producer," Stern said. When these moons suffer impacts, he explained, "the ejecta goes into orbit around Pluto, and so the more satellites, the more concern we have." Stern and his colleagues are inventorying the Pluto system with Hubble to get a better handle on the risks New Horizons faces, and to help design the safest possible trajectory for the spacecraft. Adjustments to the probe's path could even be made late in the game, as New Horizons nears the dwarf planet, Stern said. "We have a backup trajectory called SHBOT, safe haven bail-out trajectory," he said. "We can fire our engines very late if we see something on approach of the Pluto system using our own cameras. We won't go as close to Pluto in that case. In terms of macroscopic objects, we can go down to objects just a few kilometers wide. Also, we can look for rings and individual particles that are small." While P5 is keeping New Horizons scientists on their toes, the newfound satellite is further whetting their appetite for what the spacecraft will discover three years from now. "It's another reminder of how little is known" about the Pluto system, Stern said. "Every time we look harder, we find new stuff: An atmosphere, polar caps, more and more moons, a big albedo. When New Horizons gets there, I think it's going to knock our socks off. It's going to be whole new world." Natalie Wolchover (@nattyover), staff writer at SPACE.com sister site Life's Little Mysteries, contributed to this story. Follow SPACE.com senior writer Mike Wall on Twitter @michaeldwall or SPACE.com @Spacedotcom. We're also on Facebook and Google+.